Baltic Restaurant and Bar is a sleek modernist venue with cosy alcoves and muted colour banquettes. The exposed wooden beams and high vaulted roof of glass gives the restaurant a light and airy atmosphere. The menu specialises in Eastern European cuisine. "Baltic is housed in an eighteenth century former coach builder’s works and although redesigned, the original character is beautifully retained. The 40 foot wooden trussed ceilings, skylights and clean lines, make dining at Baltic a truly unique experience. Specialising in the cuisines of Eastern Europe. From the soups, pickled fish and dumplings of Poland and Russia, to the hearty and spiced stews of Hungary through to the aromatic grills and light braises of Georgia and central Asia. The strength of these cuisines lies in their robust flavours and unusual spicing. The extensive a la carte menu includes favourites like; chargrilled leg of lamb with aubergine, peppers and saffron guvech; pan fried sea bream fillet with kohlrabi, caper and cucumber salad to spiced beef & smoked sausage stew with peppers, gherkins & potato dumplings. 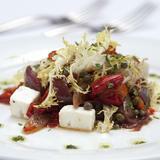 The pre theatre/set menu offers great choices at a fixed price – 2 courses from £17.50 or from 3 courses, £21.50. The weekend menu is also offered at a fixed rate – 2 courses for £21.20 and 3 courses £25.00 and includes tasty dishes such as; Georgian moussaka with Tzatziki and roast tomatoes; Salmon and haddock fishcake with creamed leak and spinach to warm salad of duck leg, beetroot and sour cherry. What did you think of Baltic Restaurant and Bar? The decor at Baltic Bar and Restaurant is pretty stunning, but it's a shame that I couldn't say the same of the food. It was nice but expensive and overrated. I will go back to the Baltic Bar and Restaurant, but only if someone else is paying. A few friends and I stumbled across the Baltic Bar by accident and we are so glad we did! The bar staff were really cool, helping us pick out our vodkas as the evening went on and ensuring we had a fantastic time. If you want a really relaxed place which (I think!) 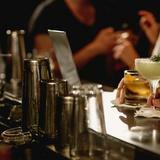 is full of friendly people then give the Baltic Bar a go. The food was eclectic and had twists which made the meal an exciting pleasure. The only problem was I was seated under the air conditioner so by the end of the evening is had a frozen neck. I will come here again but next time I'll wear a scarf. My friends and I went to Baltic restaurant last weekend and I must say we had a great evening. The ambience was wonderful and the food was very tasty, offering a superb selection of mouthwatering dishes. We chose a mixture of lamb koftas and delicious blinis for starters and chargrilled leg of lamb, with aubergine salad and salt beef with pickled vegetables and horseradish for our mains. We then spent the evening in the bar drinking lovely cocktails. Food great, staff pleasant and helpful and great atmosphere. We are already planning our next visit. Highly recommended! I had dinner at Baltic Restaurant and Bar on Saturday night. I have been coming to this restaurant for a few years but have to say the quality of food seems to have deteriorated somewhat. The Peleni (veal dumplings) were very bland, and the golonka also. Also, whilst our waiter was nice enough, his service skills were bordering on the cowboy style - fairly atrocious! On this occasion, I give Baltic a borderline 2/3 rating. Previously I'd have given it a 4/5. Eastern European cooking passed down from babcia’s kitchen is the order of the day at this unpretentious and convivial favourite in Southwark. Push aside the dark curtain swathed across Baltic’s entrance and you enter a bar packed with people drinking, eating and making merry. The triangular space narrows away so that the cavernous restaurant beyond comes as something of a surprise. The long metal bar with its slick bartenders preparing vodka cocktails has a modern vibe, but the restaurant beyond has an altogether different feel. Minimalist in style, the room is lent warmth by candlelight, exposed brickwork and wooden beams, which trapeze across the high ceiling. In a word, the atmosphere is buzzing. The restaurant proper is a generous space, yet it’s full, even on a midweek night. Waiting staff are delightful, appearing at all the right moments and making helpful suggestions regarding the menu and drinks choices. Given Baltic’s location and unassuming entrance, this is clearly a place for those in the know - the media crowd fresh out of working at ITV’s studios nearby, smartly dressed men and women on dates and birthday parties. This is no one-trick pony. The Eastern European menu is large, yet neatly divided into starters, dumplings, blinis, meat, fish, dessert and cheese. Pierogi, the classic dumplings made with unleavened dough, come with four different fillings, each a soft, dense mouthful. If you’re hungry, try the starter of blinis with a full selection of accompaniments – smoked salmon, mushroom caviar, marinated herring and Keta caviar. It comes with a healthy dollop of soured cream on the side and the blinis are thick and pillowy. This is generous, unpretentious food. 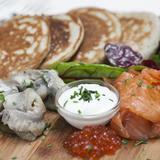 Both dumplings and blinis can be taken as mains or starters, which fits well with Londoners’ passion for small plates. The menu is diverse, packed with hearty Russian soups, Polish stews and aromatic fish dishes from the Caucasus. You’ll need the appetite of a hunter to eat a full dish of bigos, the Polish hunter’s stew. Baltic’s version is dense with venison, beef, sauerkraut and hunks of Polish sausage, even if it is a little salty. Crisp yet tender pork schnitzel is a delight, and a dessert of sernik (Polish cheesecake made with thick curd cheese) is firm and creamy. Don’t leave without trying a slice of poppy seed cake (makowiec), which takes days to make and just seconds to eat. Baltic has an extensive drinks list with wines from the New World to Georgia and back. But, say the words smoked salmon, blinis and caviar and surely a shot of thick, clear Russian vodka is in order? That, or champagne, of which Baltic serves seven different houses. Take a look at the vodka menu and you’ll find more than 60 varieties, all served in frozen glasses or by the carafe. If you’re looking for food and drink to warm the soul, this is it. In typical Eastern European style all are welcome, so invite friends and make an evening of it.